UPDATE – Please see the written apology from the Ontario Health Minister, Dr Eric Hoskins dated November 14, 2016. Sep 26, 2016 – My sister Teresa is stepping forward as a self-advocate. She has written a letter to Ontario’s Minister of Health and Long-Term Care, Dr. Eric Hoskins asking him to please send her a letter! Since July 22, 2016, Teresa has been waiting — and waiting — and WAITING — to hear from Minister Hoskins. Because on July 22, the Minister apologized on Global News TV for Ontario’s placement of Teresa in a “seniors residence” in 2013. I think most Canadians would be shocked that Teresa — at 49-years of age — was placed in a nursing home which specialized in dementia and palliative care. The Minister’s statement of apology on TV was good news. But confusingly, there was no follow up by him, or any Ministry staff! Teresa herself calls it “weird” that he has not sent her the apology in writing. I agree. Most people would expect that the Minister would have contacted Teresa afterwards. Most people would expect that at the very least he would have sent a letter to Teresa. More than two months has elapsed, and there has been NO letter expressing regret. NO phone call to say sorry. Nothing. It sends a message that they don’t really care. 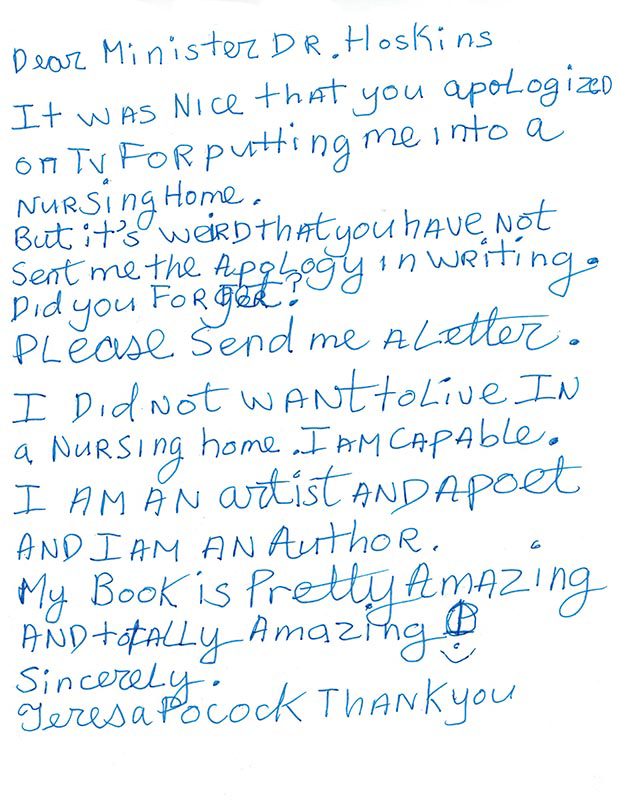 As Teresa herself writes, she did not want to live in a nursing home. Her “placement” in 2013 was done against her wishes and was very traumatic. It changed her life. Global News Journalist, Christina Stevens did a two-part news story about Teresa’s experience: “Ontario woman forced into long-term care wants apology from provincial government.” Stevens interviewed Minister Hoskins, but he refused to answer any questions about Teresa’s file citing “privacy” reasons. Teresa and I then gave permission for the Minister to speak with Stevens for the second part of the news story. The Minister’s statement of apology on television was good news. But confusingly, there was no follow up by him, or any Ministry staff! Why has there not been any follow up? The Ontario government is facing a big crisis regarding adults with developmental disabilities. The Ontario Ombudsman, Paul Dubé, has just completed a multi-year investigation into Ontario’s treatment and care of people with developmental disabilities. 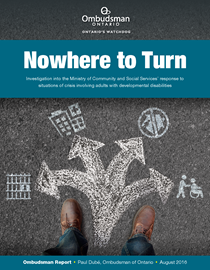 On August 24, Mr. Dubé published “Nowhere to Turn,” a highly critical report on the Ontario government’s handling of the crisis, calling it a “systemic failure”. I read the 182-page report in full, as well as numerous media reports and editorials on it. But despite sounding the alarm, the Ombudsman also struck an optimistic, upbeat note. He cited a new “culture change” and better leadership! I would like to believe Mr. Dubé. I hope that the Ontario government has turned over a new leaf — and sincerely wants to do better in its treatment of people with developmental disabilities. I believe that the Ombudsman, Paul Dubé, would want — indeed expect — Minister Hoskins to show some respect and kindness to Teresa by sending her a letter. If I had Minister Hoskins‘ ear, I would tell him that this is a golden opportunity for him to show the Ontario Ombudsman that there really has been a “culture change” in Ontario’s treatment of people with developmental disabilities. And that by sending a sincere letter of apology to my sister Teresa he will demonstrate that he is part of the change (and his apology was not just done to please the TV audience). 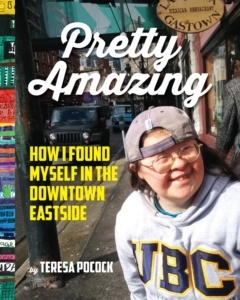 Teresa has sent her letter to Minister Hoskins — along with an autographed hardcover copy of her new book, Pretty Amazing: How I Found Myself in the Downtown Eastside. We hope the Minister replies. Human Rights Letter: BC Civil Liberties Association’s July 12, 2016 letter in support of Teresa, was co-signed by the Canadian Association for Community Living, Inclusion BC, Plan Institute, People First of Canada, Spectrum Society for Community Living, Vickie Cammack, and Al Etmanski. I remember signing a petition a few years ago to support Teresa Pocock in her fight to remain free from government ordered care in a “nursing home” for palliative care. This was before her exit and then grand arrival in Vancuver’s DTES art community. I was gratified to find her and her family getting involved with Gallery Gachet where she would ultimately show her substantial output of visual art. This was a far cry from what was expected from her by the authorities in Ontario. I believe that Teresa deserves a personal letter of apology from Minister Eric Hoskins. As Teresa evolves into a person celebre rather than a cause celebre, I continue to be *pretty amazed* that the bureaucrats cannot see their ways to initiatives, studies and serious considerations as to the dynamics of institutionalization policy. Are some families in favor of them? Then unpack why! And address those things so as to support families and community members appropriately. If we do this, then does the imperative to institutionalize dissipate? Disappear? An apology to Miz T would necessitate engagement, conversations and critical thought. Certainly hoping T does not have to wait too much longer for the deserved words.